The bitter conflict in Ukraine drags on. 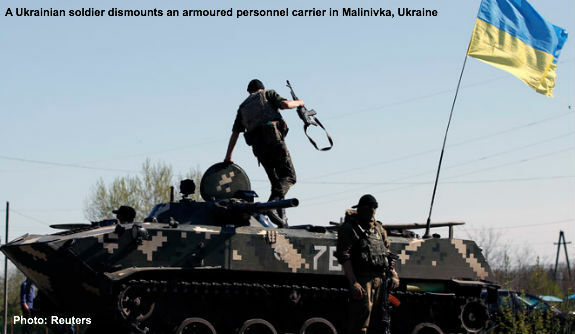 Russia continues to destabilize Kiev and NATO remains divided on how to respond. Washington has taken the lead against Moscow even though America has little at stake in Russia’s misbehavior. In fact, the crisis has generated a spate of U.S. proposals to take military action and expand NATO. For instance, Sen. John McCain urged adding Ukraine to the “transatlantic” alliance. Former UN ambassador John Bolton suggested putting “both Georgia and Ukraine on a clear path to NATO membership. Other proposed candidates for the alliance include Armenia, Bosnia-Herzegovina, Finland, Kosovo, Macedonia, Moldova, Montenegro, and Sweden. Efforts to expand NATO are strikingly misguided. The end of the Cold War eliminated the reason for creating the alliance. America’s dangerous global enemy had disappeared while Washington’s prosperous and populous allies had recovered economically and developed internationally. The U.S. no longer needed to protect Europe. However, alliance advocates acted like nothing had changed and proposed new justifications for the old organization. Member governments eventually turned NATO into a mechanism to integrate Central and Eastern European states. This task should have been left to the European Union, but Washington wanted to “lead” even when America was not directly concerned. NATO has turned into a dole for indolent rich countries. After Moscow’s collapse the Europeans steadily reduced their military outlays. Even the newer members closest to Russia put little effort into augmenting their armed forces. Now the Ukraine crisis has reminded everyone that the alliance might be called upon to confront nuclear-armed Russia. Several of the newest members are screaming for America to “reassure” them by establishing bases and deploying troops. This ludicrous situation demonstrates the folly of NATO expansion. The U.S. should not compound its earlier mistake by bringing in additional members with even less strategic value. The list of potential members suggests strategic madness in Washington. For instance, tiny Balkan states Bosnia-Herzegovina, Macedonia, and Montenegro never have mattered and never will matter for U.S. security. Kosovo is even worse. This disputed state is the product of NATO’s first aggressive war, the 1989 campaign to dismember Serbia, which had threatened no member of the alliance. Tens of thousands of ethnic Serbs remain trapped in what some Europeans acknowledge to be a gangster state, denied the right to self-determination granted Kosovars and others. Defending Pristina would not be a good use of U.S. troops. Finland and Sweden are perfectly pleasant nations which followed independent, neutralist policies during the Cold War and face no significant threats today. Why should America protect them? Armenia, a former republic in the Soviet Union, is the most distant country now proposed for NATO membership. It’s impossible to concoct even a vaguely plausible argument that this nation, locked in a bitter territorial dispute with neighboring Azerbaijan, has the slightest relevance to the security of America. Then there are Moldova, Georgia, and Ukraine. Attempting to defend them would dramatically degrade U.S. defense since all three have territorial disputes with nuclear-armed Russia that have triggered or could trigger war. Moldova is a small nation nestled between Romania and Ukraine. A piece of Moldova, Transnistria, broke away with Moscow’s support. Chisinau is in difficult circumstances, but not one warranting American military involvement. Georgia long has wanted to join NATO. In fact, Tbilisi sacrificed the lives of its soldiers in America’s Afghan and Iraqi misadventures hoping that providing cannon fodder for Washington would convince U.S. politicians to back Georgia in any war against Russia. Tbilisi recklessly provoked Moscow to arms and attempted to drag Washington into war back in 2008. Whatever America’s modest economic and energy interests in the region, none warrant confronting Russia on its border, a region treated as a vital interest by Moscow. The only less appropriate NATO member would be Ukraine. While Ukraine’s status is largely of theoretical interest to America and economic value to Europe, Russia views its connection to the former Soviet republic to be of critical security importance. After preserving the peace with the Soviet Union throughout the entire Cold War, Washington should not risk conflict with Russia today over far lesser stakes. Washington should turn Europe’s security back to Europe. There’s no reason for Americans to threaten war over such tiny irrelevancies as Montenegro and Kosovo, distant obscurities as Armenia, and conflict magnets as Georgia and Ukraine. The ongoing strife in Ukraine is a crime by Moscow and tragedy for Kiev. It’s also a warning for America. NATO is a military alliance, not a social club. Expanding NATO would make the U.S. less safe. Instead, America should be shrinking its alliance commitments.